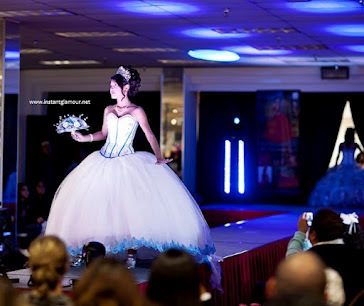 Traditional quinceanera dresses invoke a simpler time. This blossoming orange 15 dress is absolutely gorgeous. The patterns and fire-orange color somewhat remind me of a burning flame. Traditional dresses are becoming more popular today. Throwback themes are spreading. Imagine riding into your party on a beautiful horse. Or what about being delivered in a horse-drawn carriage. Throwback themes and tradtional Mexican quinceanera dresses are a great way to show your appreciation for your heritage and your roots. All your older family members will recognize you as being wise beyond your years. Finding a traditional quince dress is a little bit tougher. Ask around in some of your parents' circles about older seamstresses that might be willing to sew one for you. You will be amazed at the quality and the cheap price compared to the modern dresses sold in stores.